Puggle puppies often inherit the folded face characteristics associated with their pug bloodlines. The puggle puppy is a hybrid cross between a pug and a beagle. This means that this type of puppy cannot be registered as a purebred with the American Kennel Club. However, that doesn't prevent them from taking their place in your heart as a loyal companion. As the puggle is still considered a "fad" dog whose very existence is driven by the demand for designer style dogs, breeding programs are still developing. According to the Embrace Pet Insurance website, it is still challenging to find a puggle breeder whom is more interested in cross breeding the pug and beagle for the sake of eliminating hereditary issues versus capitalizing on the social trend. It is recommended that potential puppy purchasers evaluate any puggle breeder by comparing their specific kennel standards to those upheld by both the National Beagle Club of America and the Pug Dog Club of America. 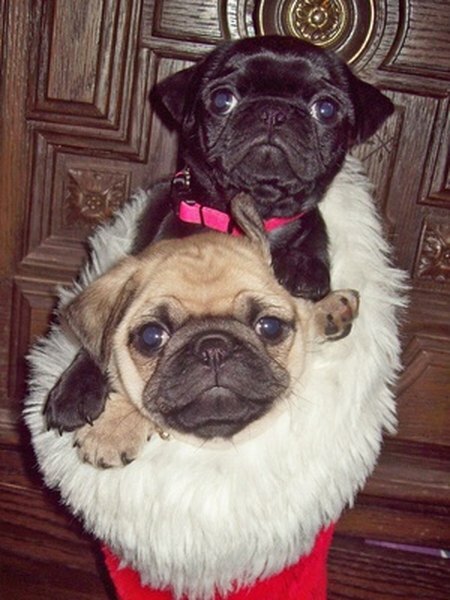 The physical results of crossing a pug and a beagle are one of the main reasons the puggle is a sought-after lapdog. According to the Puggle website, a full grown adult weighs between 15 and 30 pounds standing 10-15 inches at the shoulders. The dog's short, smooth and straight hair makes grooming their bodies a simple chore. However, their faces - especially as pup growing in to their bodies - are characterized by the deep folds associated with the pug side of their ancestory. Their faces need to be wiped with a moist cloth regularly to keep food from accumulating and causing infections. Most first generation puggles are either fawn or tan color with a black mask. Color variations including black and white occur more frequently in the second and subsequent generations of the crossed bloodline. The puggle desires to please his people. Puppies are highly energetic and want to be with you constantly. As a human companion, you should be emotionally available to meet a high level of interaction between yourself and the dog. If not, the puggle can resort to undesired behaviors. This isn't to say that the dog should dictate the parameters of the relationship. It is essential to set boundaries for a successful relationship. Establishing a routine with times to play, times to eat and times to be alone will prevent you from over-indulging the pup thus creating an adult that is unmanageable. Puggle puppies are extremely intelligient and rather motivated by treats. Giving them a tiny snack along with affirming praise quickly teaches them they will be rewarded for following your direction. This advanced ability to learn can add to your relationship as the puppy learns basic commands. According to the Puggle website, most puggles easily master the following commands: sit, down, stay, settle, off, take it, leave it, fetch, roll over, give me paw and come. While the puggle is a basically hardy dog, it is sensitive to temperature changes. The pug side of their ancestory is known for being intolerant of temperatures ranging above 85 degrees and of higher humidity levels. 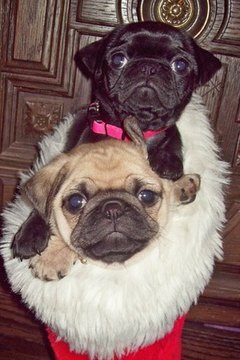 According to Pug Village, pug dogs are suspectible to heat strokes. The beagle side of their bloodlines does not carry a thick layer of body fat leaving them prone to getting chilled more quickly than other breeds. Dog Time: How Much To Feed a Puppy? ABC News: Are Designer Dog Trends Bad For Dogs?